Gluttony might be one of the seven deadly sins, but on Thanksgiving day and the few days thereafter, we all seem to be forgiven (or at least try to forgive ourselves). As we gorge on every delicious indulgence, we tell ourselves that come Monday, we’ll hit the gym and lunch on salad to make up for the carb/sugar/meat fest that we partook in the weekend prior. Alas, today I’m posting a recipe that can still speak to the comforts of home, while making you feel like you’re cleansing you’re body of all things toxic. I have a confession to make: this is the first time I have made chicken stock from scratch, and it was a great epiphany. So great, that I’m planning on doing it again. And again. And again. We had friends over for dinner a few weeks ago, and decided that our menu would consist of the simple comforts of home: tomato and goat cheese flatbreads, and this warming soup, followed by handmade strawberry hand pies. We made the stock the night before our dinner party, boiling a whole chicken with carrots, celery, fresh ginger, bay leaves and some other herbs, skimming the fat occassionally over the course of the 1.5 hours it cooked. The aroma that filled our house was indescribable–a smell that made me think of my mother’s kitchen, and her mother’s kitchen before her. The females in my family have helped me appreciate home cookin’ in the truest sense, and when I think of home cookin’, I think of chicken soup. My mom’s chicken soups are epic–broth and noodle, and my favorite, matzo ball. When I was younger, I truly didn’t know how to appreciate broth. I’d ask for it ‘on the side,’ so to speak. I’d scoop in four or five giant matzo balls, and top with half a ladle of broth. I was not wise then, like I am now–or am trying to be. What I know now is that a good chicken noodle soup is only as good as the homemade broth. The fresher the vegetables, the better then chicken (free-range, organic, kosher…), the right amount of seasoning. These are the elements of the best kind of chicken soup. We took a page from one of my favorite cookbooks, Cooking for Friends, which was gifted to me by my friend Lauren (the girl KNOWS her books), and the thing is rarely left sitting in its spot on the bookshelf. This soup has all of the elements of the homey chicken soup that my mom used to make, with a spicy Asian-inspired twist in the form of some ginger, greens, a squeeze of lemon, and a few generous squeezes of Sriracha sauce. 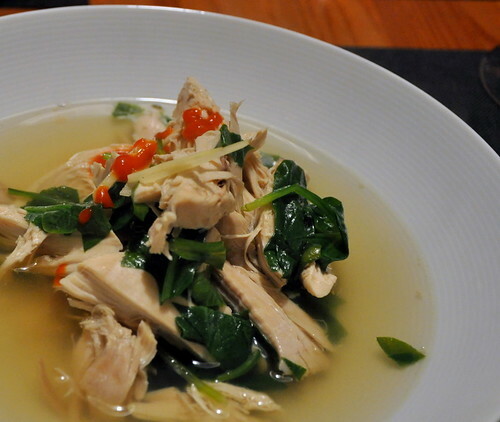 It is the pho of chicken soup. And now that we’ve officially hit winter, it is the chicken soup to help you survive these next few weeks before another nice, relaxing holiday. 1. 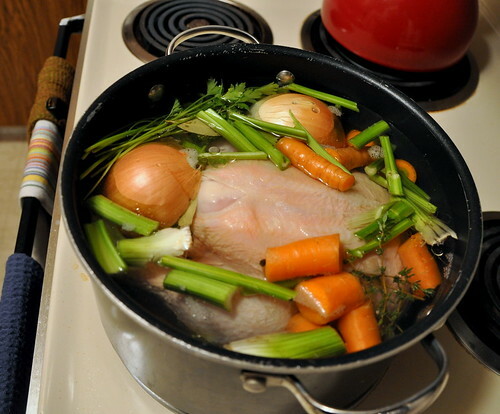 Make the stock by placing the chicken in a large pot. Add in the knob of ginger,onion, celery, carrots, parsley stems, thyme springs, peppercorns, bay leaf and 1 teaspoon of salt. Fill the pot with cold water, making sure to cover all of the ingredients by about 2 inches. 2. Bring to a boil quickly. Lower temperature and simmer for about one and a half hours, skimming off any white foam that floats to the surface. Pierce the chicken in the thickest part of the thigh, making sure that the juices are running clear. 3. Carefully remove the chicken from the stock, and transfer to a plate to cool. Meanwhile, strain the stock using a colander, discarding the solids. 4. Line a sieve with two layers of cheesecloth and strain the stock again. The cheesecloth will capture any fat left behind. Set aside. 5. Shred the meat right off the chicken using your fingers (make sure to discard skin and bones), and add the chicken pieces to the stock. Season with additional salt, to taste. 6. Bring the stock to a boil and add the spinach, cooking for just a few minutes. 7. Serve soup garnished with some thinly sliced ginger, sriracha sauce and a squeeze or two of fresh lemon juice.